The Cleo Active leggings are available in two sizes; S/M and M/L. The small/medium have a velcro closure with open toes and can fit a calf size up to up to 44cm. The medium/large have a zip fastening and can fit calf sizes up to 55cm. 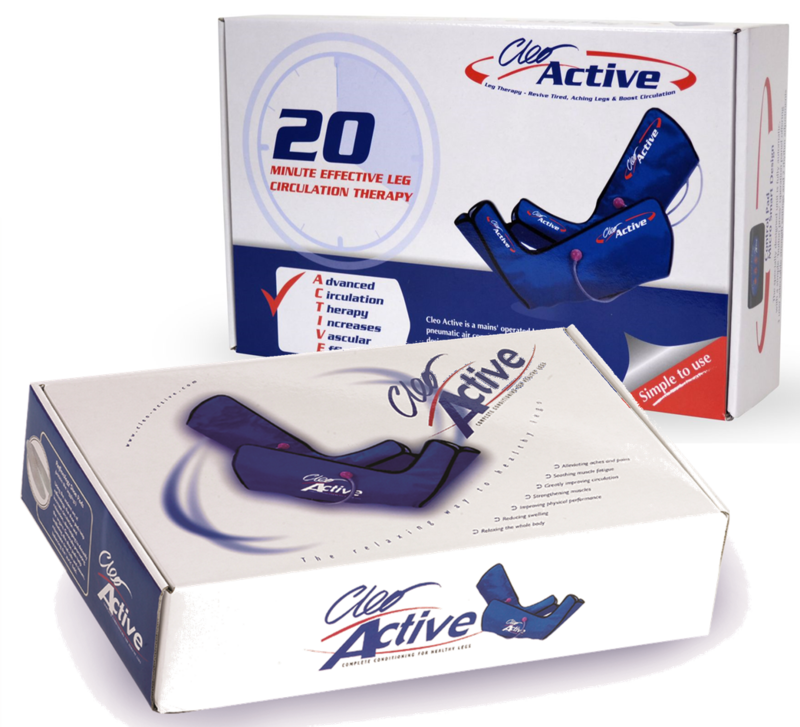 However, be aware that the Cleo Actives legging boots offer a compression massage, and so will compress to the size of one's leg so they will always end up fitting to the size of your leg. Formulated with a nutrient rich herbal blend of ingredients, it leaves your legs feeling wonderfully smooth, soft and revitalised. It also improves the appearance of reddened or tired skin, helps to stimulate circulation and reduce inflammation. Vitamin E: a vital ingredient in skin care a natural anti-oxidant vitamin which acts as a co-enzyme in cellular membranes it serves as a free radical scavenger protecting skin cells against external aggressions and toxins. Other known benefits are: it helps prevent age spots, reduces the appearance of stretch marks, replenishes dry skin by reducing trans-epidermal moisture loss, thus improving the overall texture and appearance of the skins surface. Chamomile: when used topically chamomile exhibits antibiotic and anti-inflammatory activity. It cleanses the pores and reduces redness / irritation. Its soothing and calming properties make it ideal for people with very sensitive, itchy or blotchy skin. Comfrey: particularly effective on slow healing wounds and is traditionally used to repair tissue damage, treat psoriasis, eczema, sores, varicose veins, ulcers and chapped skin. This is mainly due to one of its active ingredients -allantoin a powerful cell proliferator used to stimulate growth of new skin cells. Arnica: is traditionally known to stimulate blood circulation which is why it helps disperse bruising. It is also reported to soothe muscular aches and pains. *Cleo Active manufacturers' warranty covers electrical component parts only; excludes accidental / deliberate damage or mis-use). In the unlikely event that your product develops a fault within the warranty period then we will issue a replacement part immediately.